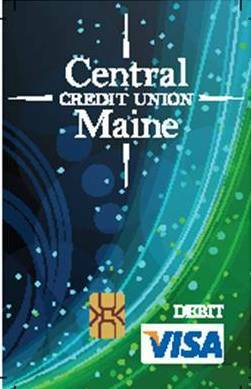 Central Maine Credit Union has your back with chip technology which provides enhanced security with every transaction. Your chip Debit Card has an embedded microchip for a more secure transaction. You will also have the convenience to withdraw cash, check balances, pay bills, and make purchases at participating retailers, all with one card. IMPORTANT! If your new chip Debit Card has the same number as your existing card, you will use your existing PIN. Once you have activated your new card, destroy your old card. Activate your new card as soon as possible. Sign your card immediately; it is not valid until you sign it. Never reveal your PIN to anyone, and do not write it on your card. Use ATMs wisely, and be alert especially in unfamiliar surroundings. Credit transactions benefit your credit union. If you do not see this option, ask for assistance. 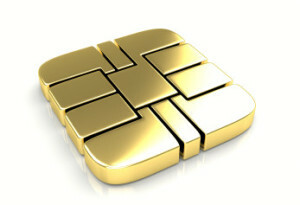 EMV- which stands for Europay, MasterCard and Visa- is a global standard for cards equipped with computer chips and the technology used to authenticate chipcard transactions. In the wake of numerous large-scale data breaches and increasing rates of counterfit card fraud, U.S. card issuers are migrating to this new technology to protect consumers and reduce the cost of fraud. For merchants and financial institutions, the switch to EMV means adding new instore technology and internal processing systems, and complying with new liability rules. For consumers, it means activating new cards and learning new payment processes. Most of all, it means greater protection against fraud, for card present transactions. Card not present (Internet, phone, etc.) fraud is expected to increase with EMV cards. What is the benefit of my new chip debit card? Europay, MasterCard and VISA (EMV) requirements ensure the exchange of data between chip-based payment cards and terminals. Chip debit cards are a standard payment method around the world, so having this feature makes purchasing abroad much easier. A debit card with a microchip is more secure than one with just a magnetic strip on the back because the account information is encrypted in the chip, making it more difficult to fraudulently copy the debit card details. The card chip stores cardholder data securely; protects against unauthorized modification; reduces the number of fraudulent transactions resulting from counterfeit, lost or stolen cards. Why are EMV cards more secure than mag stripe cards? The magnetic stripes on traditional credit and debit cards store unchanging data. Whoever accesses that data gains the sensitive card and cardholder information necessary to make purchases. That makes traditional cards prime targets for counterfeiters, who convert stolen card data to cash. If someone copies a magnetic stripe, they can easily replicate that data over and over again because it doesn't change. Unlike magnetic strip cards, every time an EMV card is used for payment, the card chip creates a unique transaction code that cannot be used again. If a hacker stole the chip information from one specific point of sale, card duplication would never work because the stolen transaction number created in that instance wouldn't be usable again and the card would just get denied. Experts hope it will help significantly to reduce fraud in the U.S., which has doubled in the past seven years as criminals have shied away from countries that already have transitioned to EMV cards. Just like magnetic stripe cards, EMV cards are process for payment in two steps: card reading and transaction verification. However, with EMV cards, you no longer have to perform a quick, fluid card swipe. Chip cards are read in a different way. Instead of going to a register and swiping your card, you are going to do what is called 'card dipping' instead, which means inserting your card into a terminal slot and waiting for it to process. Step 1: With the front facing up, insert your card into the ATM or in-store terminal. When an EMV card is dipped, data flows between the card chip and the issuing financial institution to verify the card's legitimacy and create the unique transaction data. This process isn't as quick as a magnetic swipe. A little bit of patience will be required. Do not remove your card until the transaction is complete. If you remove it too soon, your transaction will be cancelled. Chip-and-PIN cards operate just like the debit card you have been using for years. Entering a PIN connects the payment terminal to the payment processor for real-time transaction verification and approval. However, many payment processors are not equipped with the technology needed to handle EMV chip-and-PIN credit transactions. There aren't going to be many issuers requiring a PIN. A vast majority will be issuing chip-and-signature cards, which aren't all that different from how credit cards work now. As with a magnetic-stripe card, you sign on the point-of-sale terminal to take responsibility for the payment when making a chip-and-signature card transaction. If a terminal doesn't have the ability to accept a PIN, it will then step down to accepting a signature. There will always be a secondary option. Yes. The first round of EMV cards, many of which are already in consumers' hands, will be equipped with both chip and magnetic-stripe functions so consumer spending is not disrupted and merchants can adjust. If you find yourself at a point-of-sale terminal and are not sure whether to dip or swipe your card, have no fear. The terminal will walk you through the process. For example, if you enter a card into the chip reader slot but the reader isn't activated yet, it will come up with an error and you'll be prompted to swipe the card in order to use it. If a consumer tries to swipe the card instead of inserting it, an error will appear and they will be prompted to insert the card for chip processing instead. If chip-card readers are not in place at a merchant, your EMV card can be read with a swipe, just like a traditional magnetic-swipe card. You can still conduct transactions, you just lose that extra level of security. Many large retailers, such as Walmart, Target and Costco, have upgraded their POS terminals and are activating them for chip card acceptance, but smaller businesses are lagging when it comes to upgrading their payment technology. The U.S. is the last major market still using the magnetic-stripe card system. Many European countries moved to EMV technology years ago to combat high fraud rates. Should I continue to notify you before I travel internationally? Yes. The credit union will maintain our block on foreign transactions so you need to contact us in advance of your trip and we can set up your card to work while you are traveling and to ensure that legitimate purchases are approved. After October 1, 2015, the liability for card-present fraud will shift to whichever party is the least EMV compliant in a fraudulent transaction. Automated fuel dispensers will have until 2017 to make the shift to EMV.